Here’s what’s up in the world of TV for Thursday, October 11. All times are Eastern. 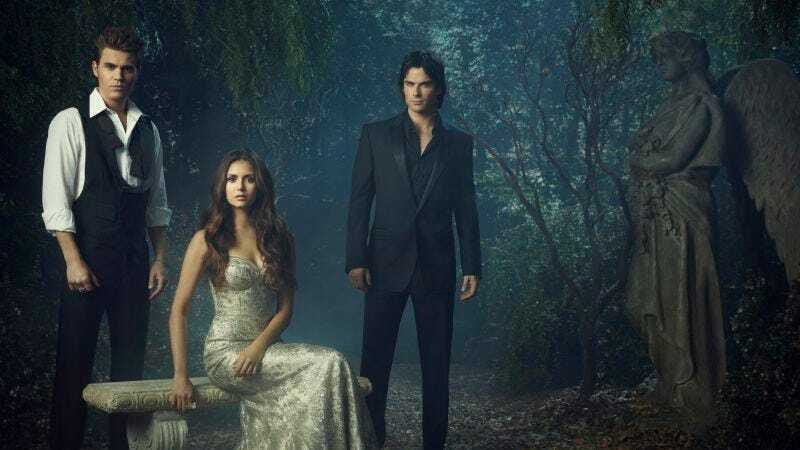 The Vampire Diaries (The CW, 8 p.m.): As the network that operates outside of network standards (You can’t tell it what to do! [Slams door.] Sometimes it wishes it was never even formed from the husks of UPN and The WB! ), The CW responds to tonight’s vice presidential debate by broadcasting a pair of additional, fictional perspectives pulled from fantasy worlds. Carrie Raisler lobbies for federal CW funding, if only to keep a potential vampirized Elena on the air. Last Resort (ABC, 8 p.m.): Pizza Hut is promising a lifetime of pizza to whomever asks the presidential candidates about their favorite toppings during next Tuesday’s town hall-style debate. Scott Von Doviak, meanwhile, pledges eternal friendship to anyone who asks Barack Obama or Mitt Romney about how they’d resolve the inciting incident of Last Resort. The Big Bang Theory (CBS, 8 p.m.): Fans of early ’00s Disney Channel sitcoms take note: After losing Bent to a burned-off six-episode order, Even Stevens’ Margo Harshman resurfaces as Sheldon’s new lab assistant. “Whither A.J. Trauth?” wonders Oliver Sava. The X Factor (Fox, 8 p.m.): We’ve had a difficult time finding a readership for the lesser of this fall’s singing competitions, so we’re cutting it loose after this week. Jessica Jardine belts out a swan song for the show, with mentoring assistance from Justin Bieber. 30 Rock (NBC, 8 p.m.): After spending six seasons as merely a name muttered under Kenneth Parcell’s breath, “my mom’s friend Ron” manifests in earthly, Bryan Cranstonian form. With the show unable to stretch its dash of Cranston to also encompass the role of Mrs. Parcell, Pilot Viruet settles for the next best thing: Canadian treasure Catherine O’Hara. Up All Night (NBC, 8:30 p.m.): Disappointed that the debate is preempting Parks And Recreation? Try not to think about what a half-hour of that show called “Jerry Duty” would look like. Up All Night’s “Jerry Duty” fills the Rob Huebel void on a Childrens Hospital-less Thursday, so Margaret Eby’s not complaining. Project Runway (Lifetime, 9 p.m.): If the show has struggled so visibly to fill its 90-minute installments this year, what will fill out this two-part, three-hour (!) finale? Pints of John Teti’s blood? It’s Always Sunny In Philadelphia (FX, 10 p.m.): No, the cast was not replaced by the likes of Haley Joel Osment, Candace Cameron Bure, and Xzibit. However, we did hear you like Emily Guendelsberger, dawg, so we put an Emily Guendelsberger on your It’s Always Sunny review so you can read Emily Guendelsberger while you watch. The League (FX, 10:30 p.m.): The fourth season begins by raising the question of our times: Should Kevin and Jenny have their kid circumcised? Either way, league commissioner Margaret Eby is currently fielding your picks for who will perform the procedure. Star Trek: Deep Space Nine (11 a.m.): Zack Handlen tags along as the crew of the Defiant is blasted back to 2024, where the poor, unemployed, and mentally ill are huddled into “Sanctuary Zones”—do not show this episode to your conspiracy theory-prone, right-leaning mother-in-law before the Biden-Ryan debate. 2012 Vice Presidential Debate (Multiple networks, 9 p.m.): This promising freshman sitcom revolves around the odd-couple antics of an older guy prone to putting his foot in his mouth and a younger guy whose charisma smooths over some questionable character flaws. We don’t see this lasting past the first Tuesday in November. Beauty And The Beast (The CW, 9 p.m.): Kristin Kreuk plays a police detective that one might be tempted to call a “beauty.” Jay Ryan plays a guy with a facial scar that barely qualifies him as a “beast.” Todd VanDerWerff and Erik Adams’ review of the rebooted 1980s Linda Hamilton-Ron Perlman vehicle will reflect both sides of the show by being both beautiful and beastly. Little Shop Of Gypsies (TLC, 10 p.m.): Temporarily low on Thompson-Shannon reserves, TLC reaches back into the gypsy well for a series that, at the very least, will get the Little Shop Of Horrors theme stuck in your head. See? It’s already there. The Greatest Event In Television History (Cartoon Network, midnight): Not much is known about this Adult Swim special, beyond the facts that it stars Adam Scott and Jon Hamm and was directed by Lance Bangs. We’d say that’s at least halfway to living up to such a hyperbolic title. Shutter Island (Syfy, 8 p.m.): A frustrating twist does all it can to capsize this Martin Scorsese thriller, but plenty of atmosphere and a fiery performance by Leonardo DiCaprio keep the film upright. Pure Country (Flix, 9 p.m.): Before his former TV wife played a fictional country star on Nashville, Kyle Chandler walked the fake honky-tonk path in this 1992 film that, despite flopping at the box office, provided star George Strait with his most successful album to date. MLB Playoff: Game 4: Orioles at Yankees (TBS, 6 p.m.): New York notched a decisive victory in Game 1, before Baltimore took a hard-fought Game 2. It all ends for one team tonight—or the series goes to one final game at Yankee Stadium. Chicago Fire: Zack Handlen and Todd VanDerWerff watched the first three episodes of a show that’s all about people in risky situations—but, unfortunately, refuses to take any major risks itself.